The Colours Suite was recorded live at the 2016 Ljubljana Jazz Festival in Slovenia. The suite works in eight tracks and is performed by a wonderful sextet featuring two drummers, two horns, bass and guitar (don't worry, I'll elaborate on all of these wonderful performers soon). If you're anything like me, an ensemble which contains two drummers has you jumping in joy; and it seems the same is true for composer and band-leader Samo Salamon. In the liner notes, Salamon mentions that the possibility of an ensemble like this was something that he was very eager to try, so he wrote all eight pieces (this is a white lie, which I'll elaborate on later) with each performer in mind. Salamon aspired to make this an exciting and important one, and the results certainly justify his aspirations because this set is everything but underwhelming. The Colours Suite is an album where everything has fallen exactly into the right place. An ensemble of fantastic performers meets an imaginative composer, and it's all lovingly and meticulously recorded and produced. The compositions leave plenty of room for the performers to improvise freely. I imagine them to work as rough guidelines with sparsely placed themes and ideas, even more than they do in similar jazz explorations in this vein. When the compositions lend so much freedom to the performers, and the performers are all so exciting and unique, it seems that breaking down the sextet should be my best plan of attack for explaining what make The Colours Suite so wonderful. I'll start with the two drummers, Roberto Dani and Christian Lillinger. 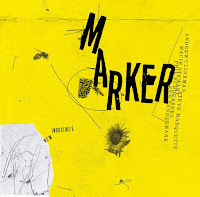 Dani is a friend and collaborator of the composer, but this is their first meeting with Lillinger who is better known as a free improviser, and for his work with the German avant-classical ensemble zeitkratzer. The two often play together and seem to merge together, but at other times it could be said that Dani plays more rhythmically and Lillinger more atmospherically (of course I am just guessing at who is doing what). Most often it is difficult to separate their performances unless focus is pushed solely towards them, and the rest of the ensemble is far too exciting to let that happen. 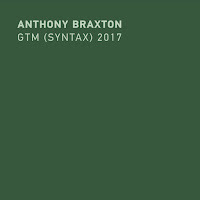 I've previously thought of legendary free jazz / improvisation drummer Tony Oxley's greatest ability as being able to generate a full and sudden soundscape out of nothing more than a controlled, and occasionally even sparse, flurry of immediate sounds – this is something that can be seen in the performance here as well. A particular moment on Black has the two performing rapid-fire strikes on the rims of their instruments, creating a startling and textural wall of small sounds. Other moments have Dani demonstrating a very subtle control of the rhythm, which he morphs and breaks in completely unpredictable ways, while Lillinger plays unexplainable improvisations which land somewhere between Chris Corsano and Eddie Prévost. Up next is German bassist Pascal Niggenkemper, who's made a small name for himself as a band-leader and through his improvisation trio, who I've never personally heard but could not possible ignore with such a wonderful name, Baloni. While the dual drummers are often too busy minding their own avant-garde business, Niggenkemper is left as the only rhythm instrumentalist to perform their traditional task. His performance often simple and efficient, creating a powerful pulse to guide along the performances – and I must also note that he is perfectly mic'd and can be heard clearly, therefore avoiding a problem I often have with live jazz recordings. Calling him simple is an understatement however, restrained is certainly more apt since he keeps several tricks up his sleeve to be used when necessary. The opening to 'Blue' is a perfect example, where he performs a sprawling bassline that feels like a perversion of the walking basslines found in classic jazz. A more noteworthy example is in 'Green', where he pulls out a bow to perform the longest unaccompanied solo on the entire album, which is equal parts surprising and outstanding. Next we have Julian Argüelles on both tenor and soprano saxophone and Achille Succi on bass clarinet. It is significantly easier to tell these two apart than the two drummers, but even more than them they keep quite closely together. The two often experiment with relative pitch, which can be very excited as Argüelles moves between the high-pitched sopranino and low-pitched tenor, allowing him to play both above and below Succi's bass clarinet. This also provides many opportunities for harmonies, which actually ends up being a technique the duo seldom uses, but with great affect. Argüelles typically plays significantly faster than Succi, shooting out quick scales while Succi meditates on low-end belches. 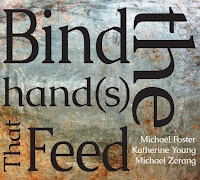 An exercise I've found enjoyable while listening is attempting to juxtapose the percussion duo with the horn duo, as they operate in intriguingly distinct ways. 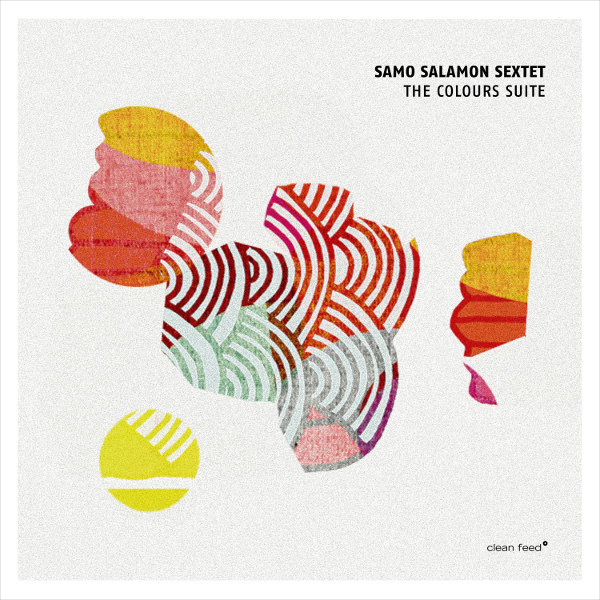 At this point you may have noticed that I've left Samo Salamon, the only member of the sextet with his name on the album cover, to last, perhaps due to a "saving the best for last mentality", but that is actually not the reason at all. I've left him for last due to what is one of the album's biggest surprises: that Salamon by far has the least screen time out of any of the performers. His performance is subtle and subdued, with only occasional eruptions (such as the devastating solo in 'Yellow' which comes as a complete shock, calling reference to noise rock guitar before any jazz idiom). For many sections he sits in silence or in the background, creating an ambience which one might glance over if they don't pay attention. With an attentive ear, one might find him to be the most original and inspired performer of the bunch – subverting all genre clichés, and even what may be expected to happen within the tracks. This leads me to think that, perhaps, his scores is very different than that of the rest of the band, giving himself even more room and less guidance than the others. The sextet all blends together curiously. In the most upbeat moments it feels exciting and meticulous, but in the sparser moments it can feel like all control is lost. If I had to choose a single complaint about this album, it would be the lack of intelligent interplay during these sparse moments. Too often it feels like the performers are all ignoring each other, creating a polyphony that, while enjoyable, gives me the feeling that something greater could have been achieved if these performers were more experienced with each other. Lillinger and Niggenkemper usually seem to fend best in these moments, which may not be a surprise due to their free improvisation experience, but the rest of the ensemble does not fall so far behind that becomes is a major issue. The last track is titled 'Grey', and is the only track where Salamon doesn't have a sole composer credit. The whole band is credited as composer on this piece, leading me to believe it to be a live improvisation (it certainly sounds the part). The piece is slow, mysterious and dark, or rather, grey. The musicians who previously stuck together are now miles apart, leaving logical interplay behind them. The track does result in a vague sense of progression, which takes the form of a slow build and quick departure. 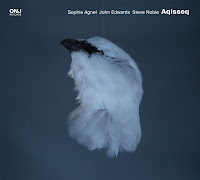 Argüelles eventually moves towards a pseudo-melody on his sopranino saxophone, and Succi joins him in a not-so-obvious way, but the rest of the band stays free and baffling. Whether it's truly free improvisation or not, 'Grey' feels like a wonderful ending to a wonderful set. 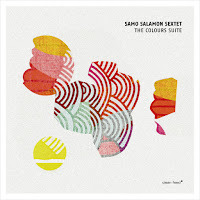 On The Colours Suite, Samo Salamon and Co. have assembled a document which is both exciting and multi-faceted. 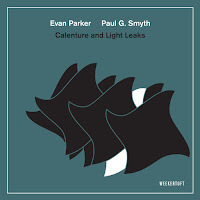 Each member of the sextet is a wonder to listen to, and each pulls their instrument through several terrains whether it be together or independently. I think the album is one that will appeal to both jazz fans who are looking for something invigorating and punchy or those who are looking for something new and experimental – and especially if you're someone like me who is looking for both, The Colours Suite is not one to miss.